Sure it’s great for the town… – …eats, reads & rambles. This was originally posted on my old blog, Go Chase Your Dragon back in 2013. I was reminded of the graffiti which inspired it earlier this week and it still warms the cockles of my heart so I had to dig this out again! Last week the global spotlight sprang on my little hometown of Strabane when a photograph of this rather genius piece of graffiti began trending worldwide on Twitter, even reaching the attention of Academy Award winner Minnie Driver. 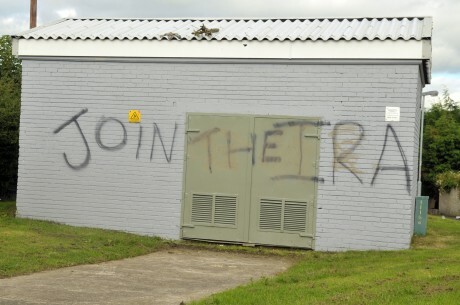 The original scrawl which decorated the side of this electricity sub-station in the Ballycolman read ‘Join the IRA’, not an uncommon sight in Strabane, but it achieved much greater media attention after a local man, naturally dubbed ‘Strabanksy’, altered the piece of graffiti to read ‘Join the Library’. It was a strange but wonderful thing to see Strabane making headlines for reasons other than bomb scares, stabbings and shootings as it has done in recent months. For a place declared the eighth worst to live in the UK by Channel 4’s experts Kirstie and Phil in 2005, a town which once boasted some of the highest levels of unemployment in the industrial world, and whose only great claims to fame include semi-successful Eurovision stars and being the most bombed town outside of WWII, it’s quite nice to be put on the map for something a little more light-hearted, positive, even hopeful. Locals have become almost immune to the paramilitary propaganda that cover the walls of the town, how refreshing to see a new message much more reflective of modern day efforts for a more peaceful, prosperous Northern Ireland. The online responses to the photo spoke loud and clear ‘Books beat Balaclavas’, surely music to the ears of staff at the local library who admitted in a statement last week “We’ve never had a better advertisement”. What a shame then, that Northern Ireland Electricity very efficiently repainted the wall of the sub-station, destroying the first masterpiece of our very own Strabanksy, stating that it is company policy to remove all graffiti from their buildings. With that in mind, I wonder how long it will take them to paint over the freshly scrawled ‘Join the IRA’ which reappeared this week. What did I tell you, full circle. However opportunist and illicit his actions, Strabanksy’s message on the sub-station wall is one to be celebrated. You should join the library and books do beat balaclavas, they prove much more useful when it comes to applying to college or university, or getting a job, or raising your children. Strabane should be making a new kind of history for itself now that we’ve, hopefully, left the Troubles in the past. Here’s hoping Strabanksy and others like him will continue to put our little town on the map for the right reasons.